Are you planning to drive on your next trip overseas? Your US state-issued driver’s license may not be enough to allow you to legally drive or rent a car in a foreign country. You may need to get an International Driver’s Permit (also called an International Driving Permit or IDP). The International Driver’s Permit program was set up by the United Nations Convention on Road Safety. Nearly 180 nations are signatories to the IDP program. Since many countries have different licensing requirements for drivers and may not recognize the licenses issued by other nations or state, the International Driver’s Permit is meant to be a uniform certification that the bearer is a licensed, legal driver. Get your AAA International Driving Permit! Hold a valid driver’s license from a US state with at least six months remaining before the expiration date. Expired or suspended licenses can not be used to get an IDP. Once issued, your International Driver’s Permit will be valid for one year. It is not renewable or extendable; if you need another IDP in the future, you will need to re-apply. Recognized in countries around the world – Because US driver’s licenses are issued by states, not by the nation, they can be confusing to foreigners. They may look at a driver’s license that says “Minnesota” or “Rhode Island” and not recognize that it is a valid US license. The International Driver’s Permit is instantly understood to certify that you are authorized to drive. Printed in many languages – The International Driver’s Permit states that you are a licensed driver in many languages, including English, Arabic, Chinese, French, Italian, Portuguese, Russian, Spanish and Scandinavian languages. This means that a police officer or rental car clerk who doesn’t know English will still be able to read your International Driver’s Permit in another language. Required for car rentals in many countries – More than 40 countries worldwide will not allow you to rent a car unless you hold an International Driver’s Permit. Required by many insurance policies – Think your regular car insurance or travel insurance will cover you if you get into an accident while driving abroad? 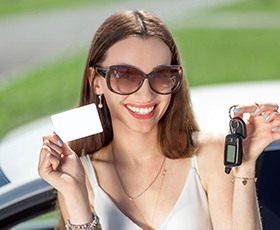 Many insurance policies cover only drivers who hold an International Driver’s Permit. In the United States, International Driver’s Permits are issued by the American Automobile Association (AAA) and the American Automobile Touring Alliance. You do not need to be a member of AAA or the AATA in order to apply. You can also order and expedite your international driver’s permit online.